There really isn’t any excuse for being wasteful. Using too much plastic is exactly that. More than likely, wastefulness has a negative impact on something or someone, somewhere else. One example is marine life. 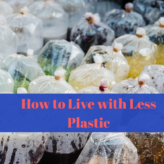 So, why should you use less plastic? For starters, plastic is accumulating and forming islands such as the Great Pacific Garbage Patch. Midway Atoll is one of the most remote islands on earth. Yet, it is surrounded by plastic carried by the current from other continents. As a result, thousands of albatrosses have died because they ate plastic floating in the ocean. Some of the items found in dead albatrosses include lighters, pens, and toothbrushes. Plastic may not bio-degrade for a thousand years. Buying convenience products costs more in the long run. Of course, it’s difficult to be 100 percent green. But, you must do what you can. Here, we’ve outlined several steps for using less plastic.